Thank you to Purex for providing me with a free bottle of detergent for this review! Laundry can be such a chore. But at least there are products which make it a little bit more enjoyable! Purex has recently introduced a new detergent which makes the chore of doing laundry just a bit better: Purex plus Fabric Softener with Crystals Fragrance. It combines the fragrance of Purex Crystals with the proven performance of Purex detergent. Plus, all Purex detergents now have the power of DirtLift Action, which works deep into clothes to get out dirt, so that they stay bright, white, and clean. I gave Purex plus Fabric Softener and Crystals a try on my laundry this past weekend. It worked great - everything's so clean and fresh-smelling. And I really like this product because, as you know, I am just a little bit frugal. Just a bit. I really don't like buying two products when I can get the job done with one! With this product, I won't need to spend on both detergent and Purex Crystals - it's built into one! That will definitely save me money. And Purex already saves me money. Last week, I bought a bottle of Purex at CVS for only 88¢ after coupons! It's hard to beat that deal. Purex estimates that an average family will save $45 per year by purchasing Purex with Crystals over the leading brand. Great savings on something you use every week! 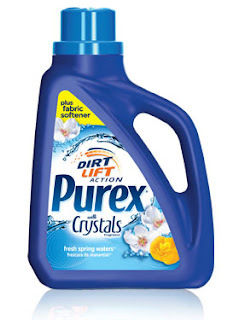 Would you like to give Purex plus Fabric Softener with Crystals a try? It's available in the liquid detergent aisle at your local Walmart, Target, Kroger, and other Purex retailers. Or would you like to try it for free? 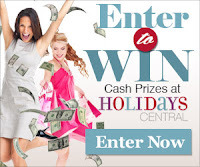 Frugal Follies is hosting a giveaway for a Purex with Crystals free product coupon! Three winners will be chosen. Here's the fine print on the coupon: Redeem for one FREE bottle of Purex detergent plus Fabric Softener with Crystals Fragrance! Manufacturer's coupon. Maximum value $6.00. Offer not subject to doubling. Limit one coupon per purchase of specified items. Limit of 1 like coupn in same shopping trip. Coupon not valid with other coupons for the same item. Expires 12/31/2014. To enter the giveaway, use the Rafflecopter below! The giveaway is open to US residents 18 and older. The giveaway ends on Thursday, April 18, 2013, at 11:59 pm EST. If you are one of the winners, Frugal Follies will contact you via the Rafflecopter email you have provided. If you do not respond within 48 hours, you will be ruled ineligible to win the prize, and another winner will be chosen. This promotion is in no way sponsored, endorsed or administered by, or associated with, Facebook. I do at least eight loads of laundry a week. I do 2 loads every 2 weeks. I do 10-12 a week. we do 8 a week. Thanks for the giveaway .. It's just my husband and I so I do about 4 a week, more if I'm doing blankets or duvet covers. I would say about 2-3 loads a week! Thanks so much! I do about 12 loads of laundry a week, on average. Between 3 - 5 loads per week. Thank you.